Starz has renewed OUTLANDER for seasons 5 and 6, Starz President and CEO Chris Albrecht announced. “Fans can rest assured their beloved Claire and Jamie will be back facing new challenges, adversaries and adventures in seasons five and six as we delve into American history and continue the story of the Frasers as they settle in the New World,” said Albrecht in a statement. 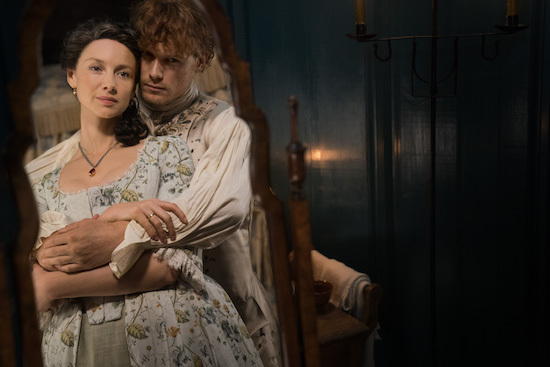 The series—starring Caitriona Balfe (Claire) and Sam Heughan (Jamie) as a time-spanning star-crossed couple—is based on Diana Gabaldon eight-book series. Ronald D. Moore, Maril Davis, Toni Graphia, Matthew B. Roberts, and Andy Harries executive produce the drama. The upcoming 13-episode fourth season of OUTLANDER will bow in November. The 12-episode seasons 5 and 6 (respectively) are unscheduled. What are you hoping to see in OUTLANDER seasons 5 and 6?